vamping up the power of your presentations. Can’t make this time/place? Then an ON-LINE TRAINING SESSION with me is the answer! No travel to learn, just jump on-line and access the course from wherever you are. You get a 1 hour, one-on-one session and we cover all the material in an intensive session. Just $250 for this *power* session. Click here and select the ‘Creative & Visual Thinking Training option and a time that suits you.What will you get from this course? This 3hr intensive course is a hands-on introduction to taking visual notes on your iPad. 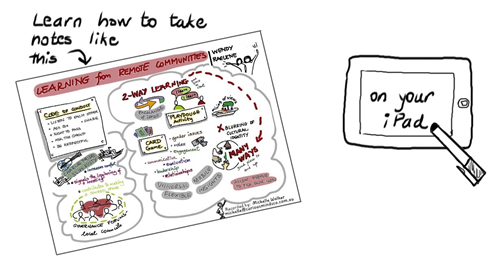 You will learn about the available drawing applications – what their strengths and weaknesses are for visual notetaking and how to apply techniques of visual thinking to create impact through boosted recall. The course is designed for any-one who wants to work more visually in their areas of professional work/study/life. You don’t need any drawing skills, but your iPad is essential. Can’t make this time/place? Then an ON-LINE TRAINING SESSION with me is the answer! No travel to learn, just jump on-line and access the course from wherever you are. You get a 1 hour, one-on-one session and we cover all the material in an intensive session. Just $250 for this *power* session. Click here and select the ‘Creative & Visual Thinking Training option and a time that suits you.